How are you? Do you have plans this weekend? We had to vote today in our State Government election and this afternoon I took my youngest to her friend's sleepover Birthday party. We've also had friends drop in today. Luckily I had the background prepared in advance for this particular card. I've again used the technique I showed yesterday combining the Something Lacy background stamp with the Irresistibly Yours patterned paper. The background is stamped with Memento Black ink over the patterned paper, blotted and then brayered with Soft Sky ink. Come and have a look. The cardstock used is Soft Sky, Whisper White and Basic Black and I've used my Beautiful Wings embosslits to cut the Butterflies. The Soft Sky band on the bottom of the card was embossed with the Fancy Fan embossing folder and the greeting from Butterfly Basics stamp set was punched out with the Decorative Label punch and raised on 3D foam on top of it. I have something extremely pretty to show you today. I've been playing with the new background stamp Something Lacy combined with the Irresistibly Yours Sale-a-bration patterned paper and here is the result on this card. I must thank Linda Heller (When the rubber Hits the Road) for this idea I saw on her blog. Let me explain further how this was achieved. The background was firstly stamped over the Irresistibly yours patterned sheet with Memento Black ink and the excess blotted and wiped off. I then brayered over the piece with Pink Pirouette ink, again wiping off any excess. I then completed my card using cardstock of Blackberry Bliss, Whisper White and Basic Black. The greeting comes from the stamp set Label Love stamped in Blackberry ink and punched with the Artisan Label punch. The butterfly is cut using the Butterfly Thinlits and in the centre of it is one of our new Something Borrowed embellishments. Heres the full photo of the card. I have a CAS card I've made to share with you today. I love when I can combine something new with something old. The new is the Butterfly thinlit die which I've used to cut out my Island Indigo butterfly and the old is last years SAB paper called Sycamore Street. Come and have a look. The cardstock colours are Pool Party, Whisper White and Island Indigo. The ink is also Island Indigo and I've used some Dazzling Diamonds Glimmer paper behind the butterfly. It's been finished with some Basic rhinestones. The greeting used is from the Butterfly Basics stamp set stamped with Island Indigo Ink. Thanks for calling in to see what I've made. I hope you have a wonderful day. Wednesday means its time for another Paper Craft Crew Card sketch challenge. We hope you will play along with us this week. Here is our sketch. I've used the Sheltering Tree Photopolymer stamp set and some Frosted Sequins left over from Christmas. Ok I deviated from the sketch a bit and used a little creative licence here and I left off the banners to fit with my design. The cardstock used is Smoky Slate, Whisper White and Strawberry Slush. Inks are Smoky Slate, Basic Gray, Soft Sky and Basic Black for "Heart". I thought this card could be used for any occasion including a Valentines day card if you so desired. It's very wintery because I'm thinking of my friends in the US who are currently in the middle of winter being blasted by a huge snow storm at the moment. We don't really experience that kind of winter here where I live. Happy Tuesday to you all. I've made another card today using similar products to yesterday's post. I've featured the Lotus Blossom Sale-a-bration stamp again and the Irresistibly Yours designer paper which I've brayered again. Come and have a look. The cardstock is a retired Pink from my stash which I've combined with Whisper White and Brushed gold together with the brayered background paper. I used Pear Pizzazz ink this time to brayer and there are a combination of Pink Pirouette, Melon Mambo and Rich Razzleberry for the blossom and Pear Pizzazz with Mossy Meadow on the stem. I stamped the birthday greeting from the Butterfly Basics stamp set with Melon Mambo ink. I hope you like today's card and wish you all a very happy Tuesday too. Happy Australia Day to you. I hope you've had a fantastic long weekend for those of you here in Oz. It was a warm one here today and I'm thankful for our new air-conditioning. The best news is that is back to school for my girls tomorrow too. I have a pretty pink card to share with you today made with the Lotus Blossom SAB stamp set combined with Irresistibly Yours Designer patterned papers. I've combined them with Deco Label and Oval framelits. Come and have a look. I've actually used my brayer on the background Irresistibly yours paper with Pink Pirouette ink. The Cardstocks used were Gold Foil, Whisper White, Melon Mambo and a vintage colour for the base called Pretty in Pink. I've used some pearls in the corner as the only other embellishment. Full view of the card is below. I'm pleased with how this card turned out. Please feel free to comment and let me know what you think too. 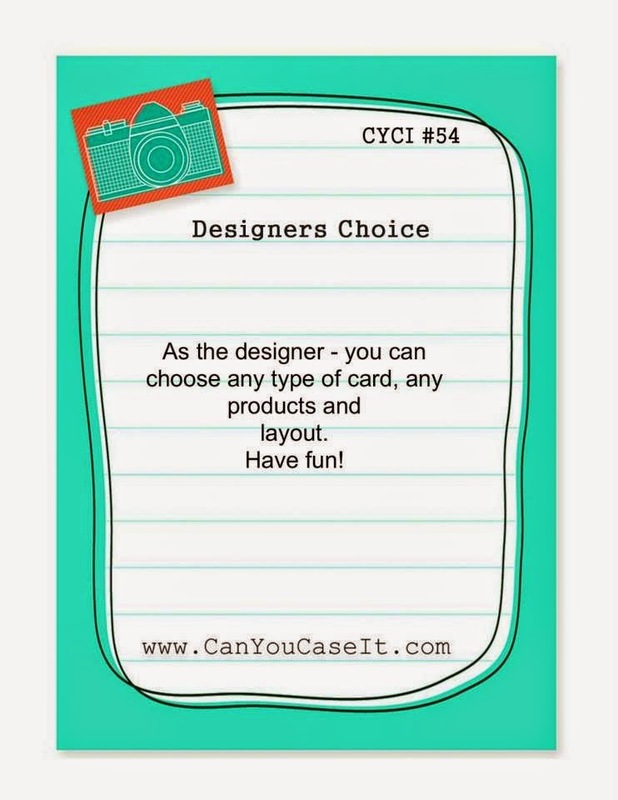 Its Sunday today and that means its time for another challenge at Can You Case It?. Here are the challenge details this week, which is Designer's choice. I've decided I would take this opportunity to showcase the card I made for my Mum's 70th Birthday. As promised yesterday, I said I would share some more information about my Mum's birthday celebrations. I have a few more photos to share with you at the end of this post. We went out for lunch with the family yesterday and gave her this card even though her birthday is actually tomorrow (Monday 26th) here on Australia Day. Its a long weekend, so she gets to celebrate even longer. This is actually an Easel card I've made using Butterfly Basics, Papillon Potpourri and Memorable Moments stamp sets. I am a little late tonight. Its been quite a day catching up with family for both my Mum's 70th Birthday lunch and my niece's 5th birthday. We've had a great day, but I'll tell you more about that later. Today I wanted to share two cards I've made. The first using the Sale-a-bration Stamp set Lotus Blossom. I've combined it with a greeting from the set Blooming with Kindness and also used one of my fav butterflies. I've used several inks to create the depth in this flower, Pink Pirouette, Melon Mambo and Rich Razzleberry. Pear Pizzazz and Mossy Meadow inks were used to stamp the stem. I've used Blackberry Bliss for the Butterfly and Blackberry Bliss & Whisper White cardstock to create the card, and the Oval Collection framelits. The background was embossed with the Beautifully Baroque Embossing Folder which is also another one of my favourites. Here's the full picture of the card. I do like how this one's turned out. Its a very wet Friday here today. I'm not complaining about the rain. I love it. It cools the place down, it fills our tanks, waters the garden and the lawn. The only thing I don't like about the rain is if I have to drive in it. I did have to at one point today and it was so heavy that I could barely see the tail lights of the car in front of me. That's a little scary. Other than that it was a pretty good day. The girls had orthodontist appointments and we have everything that they need for school on Tuesday now. I completed a card when we got home this evening. I've used Blackberry Bliss and Whisper White cardstock and inks of Blackberry Bliss, Pistachio Pudding Crumb Cake and Rich Razzleberry for this card which combined Butterfly Basics with Papillon Potpourri butterfly and the Elegant Butterfly punch. It was a quick card because I had the ferns already stamped on the Whisper White background. Here is a closeup. I'm sorry I missed you yesterday. This week has been crazy. I can't believe how many things have gone wrong and how much money we've spent in a matter of days. Yesterday I had to pack away all my cardmaking stuff and clear the spare computer desk off from the laptop I normally use for my posts and pack it away because we were to have a new air conditioner installed. Essentially I had two desks to clear as well as shop for both the new Washing Machine we needed and the air con, so nothing crafty has been done in the last couple of days. Late yesterday afternoon we got a call to say it wouldn't be done until this morning, so everything had to stay cleared leaving access free for the morning. I'm pleased to report that it was installed today and finally I got to play this afternoon and finish of a card that I had in the pipeline. To say today hasn't quite gone to plan would be an understatement. One new washing machine later after a major failure and back and forth taxi runs all day has not left much time to feel creative or play. I decided it was a good time to practice that 10 minute card challenge, and do one of my own. Very Vanilla and Cherry Cobbler card teamed with Expressions thinlits. Mosaic embossing folder and Heart Collection framelits with some Gold foil & glimmer. Ta da! Love you say? Because I'm not feeling the love today, and tomorrow's not looking good either. Lol! I hope you have a better day than mine has been. Happy Tuesday. How are you today? I've been melting in the heat here with a faulty air conditioner, and our PC has also decided its too hot to work as well. Means we are sharing the laptop at the moment. I've quickly popped on to show you my card today featuring the Butterfly Basics bundle. The cardstock I've used is Whisper White, Blackberry Bliss and Brushed gold. I've used inks of Pear Pizzazz and Blackberry Bliss and I've used our Sahara Sand lace on the bottom as you will see on the picture below. The frame has been created with the Deco Label framelits and I've used the Decorative Label Punch for the greeting. Hope you like my card. Have a wonderful day.